Telemecanique is a leading French company that produces high quality automation management systems and components for assembly line production and industrial manufacturing. Its product range includes thermal and time relays, optoelectronic switches, limit switches, contactors and others. Telemecanique is the first who make D contactors which are now used worldwide. Today, along with Schneider, Telemecanique develops a high-tech industry and invents the photoelectrical cells of a new generation Osiris. Alongside with this it implements advanced web technologies in futuristic robotics programs. Limit switch XCKN2102G11, 3A/240VAC, NO+NC, with spring return, pusher with roller Limit switch XCKN2102G11 with rated voltage 240 VAC, rated current 3 A, conact system SPDT-NO+NC, plunger with roller ф11 mm. Limit switch XCKN2127G11 3A/240VAC NO+NC with spring return, lever with roller Limit switch XCKN2127G11 with rated voltage 240 VAC, rated current 3 A, conact system SPDT-NO+NC, lever with roller. Limit switch XCKN2118G11, 3A/240VAC, NO+NC, with spring return, lever with roller Limit switch XCKN2118G11 with rated voltage 240 VAC, rated current 3 A, conact system SPDT-NO+NC, lever 35.5 mm with roller ф19 mm..
Limit switch XCKN2106G11, 3A/240VAC, NO+NC, with spring rod Limit switch XCMD2102L1 with rated voltage 250 VAC, rated current 1.5 A, conact system SPDT-NO+NC, metal plunger with roller. Limit switch XCKN2149G11, 3A/240VAC, NO+NC, with spring return, lever with roller Limit switch XCKN2149G11 with rated voltage 240 VAC, rated current 3 A, conact system SPDT-NO+NC, lever with radius from 60 up to 100 mm with roller ф50 mm. Limit switch XCKP2139P16, 3A/240VAC, NO+NC, with spring return, lever with roller Limit switch XCMD2102L1 with rated voltage 250 VAC, rated current 1.5 A, conact system SPDT-NO+NC, metal plunger with roller. 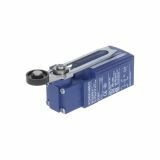 Limit switch XCMD21F2L1, 1.5A/240VAC, NO+NC, with spring return, plunger and roller Limit switch XCMD21F2L1 with rated voltage 250 VAC, rated current 1.5 A, conact system SPDT-NO+NC, metal roller with diameter ф10.6 mm. Limit switch XCMD2110L1, 1.5A/250VAC, NO+NC, with spring return, plunger Limit switch XCMD2110L1 with rated voltage 250 VAC, rated current 1.5 A, conact system SPDT-NO+NC, metal plunger with 7 mm, ф7 mm. Contactor, Four-pole, 48VAC, 2NO + 2NC, 10A Four-pole contactor model CA2-DN22, nominal coil voltage 48 VAC and nominal current of the cotact system 10 A.
Auxiliary Contact Block, LA1-D11 A 65, 2PST-NO+NC, 6A, 500VDC Contactor auxiliary contact block LA1-D11 A 65 with contact configuration 2PST - NO + NC. Auxiliary contact block, LA1-D40 A65, 4PST-4NO, 10A, 500VDC Contactor auxiliary contact block LA1-D40 A 65 with contact system 4PST - 4NO. Thermal relay, RA1-0631, three-phase, 0.63-1 A, SPST - NC, 1 A, 380 VAC Bimetal thermal relay RA1-0631, three-phase, current protection range 0.63-1 A. Contact system SPST-NC+NO with load capacity 1 A, 380 VAC. Thermal relay, RA1-116, three-phase, 1-1.6 A, SPST - NC, 1 A, 380 VAC Bimetal thermal relay RA1-116, three-phase, Current protection range 1-1.6 A. Contact system SPST-NC+NO with load capacity 1 A, 380 VAC. Thermal relay, RA1-1625, three-phase, 1.6-2.5 A, SPST - NC, 1 A, 380 VAC Bimetal thermal relay RA1-1625, three-phase, current protection range 1.6-2.5 A. Contact system SPST-NC+NO with load capacity 1 A , 380 VAC. Thermal relay, RA1-912, three-phase, 9-12 A, SPST - NC, 1 A, 380 VAC Bimetal thermal relay RA1-912, three-phase, Current protection range 9-12 A. Contact system SPST-NC+NO with load capacity 1 A , 380 VAC.